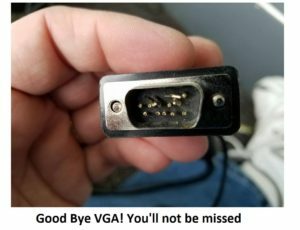 How to get rid of VGA after 30 years! Here at the M Shed in Bristol, we have amazing views of the harbor from our lovely events suit. Here we hold all sorts of events from large annual AGMs for corporations’, to weddings and some really great community events. We have a fully automated integrated audio visual system. With AMX and Creston control systems, you can walk around the function rooms holding a smart, touch screen control panel and control just about everything! 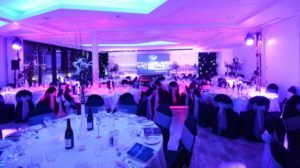 You can power up the projectors, lower the screens, open and shut the blinds, control volumes, select what to display from Sky TV, Blu-ray players and laptops, you can even change the lighting to any colour scheme you want. It’s all pretty smart. Pretty smart apart from the dreaded Video Graphics Array as the main interface, more commonly referred to as the VGA connector! For all this advanced technology, presenters still have to connect their devices with a cable. 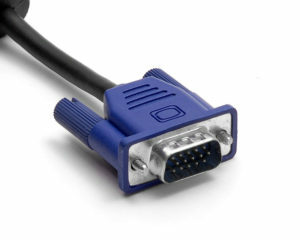 The VGA standard was invented in 1987 by IBM, and its dreaded 15 pin D Sub connector still to this day refuses to go away. There’s something amiss when a presenter asks to use their nice, brand new iPad to run their presentation and you then have to use a lighting port to VGA adapter connected to 10 meter VGA cable. These VGA connectors were designed for permanent installation and so when they are swapped between laptop and other devices several times a day, the 15 tiny pins take a battering and it only takes one bent pin for the screen to go pink, blue or stop all together. Here comes the ingenious solution to take advantage of the wireless / Wi-Fi capabilities that are now standard for all devices. The idea and solution comes in the form of finding a combination of ready available, off the shelf technology combined in such a way it allows the transmission of a device’s screen to appear on our projection system, without any wires. We needed this to be augmented into our current system without affecting its current capabilities. It is already a great intergraded AV system, it’s just needs to be brought into the future without losing its ability to use the old VGA system. It may be old but it works so well as a last resort and backup. Apple products long ago ditched the VGA system in favour of min-display ports or “lighting ports”. A quick trip to any Apple store and an assistant will enthusiastically show how with a flick of the devices, a display can be “thrown” to another screen. It’s called Air Play and is Apple’s secure version of Wi-Fi streaming. Google, with their ever innovative developments, have developed a technology called Chrome Cast to the same effect, which is also based on Wi-Fi streaming. With delegates at our events bringing Apple products, PCs and android devices, we needed an all in one system; so purchased these products to enable this streaming. I ordered an Apple TV and a Chrome Cast device which both work by connecting to a Wi-Fi network and looking for compatible devices. Both of these provide a solution for all devices. Chrome Cast is much cheaper than Apple TV and can support Apple products too, but the ease of use and reliability of Apple on Apple products seemed worth the extra investment. 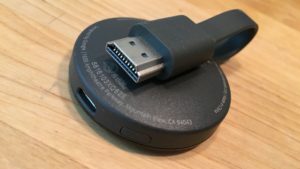 I calculated the cost of replacement VGA cables and at the current rate we replace them, these new items would pay for themselves in just three years! 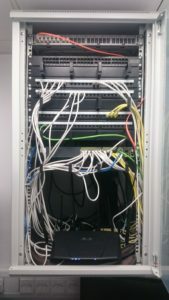 The main issue I faced in integrating these was how to patch them into a fully automated, closed AV system without affecting its capabilities. 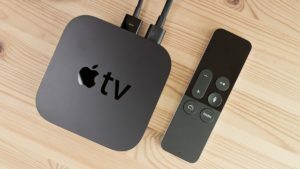 In essence, how to “retrofit” an Apple TV and Chrome Cast and get the systems to talk over M Shed’s Wi-Fi – a public network, effectively part of the councils IT network and heavily locked down. To solve the first issue, I had to literally climb into the AV racking system to find a suitable part that interfaced with an HDMI connector (both Chrome Cast and Apple TV use HDMI). I chose our SKY TV box and unplugged its HDMI cable. Onto this cable I place a HDMI switcher, which allows 4 inputs to connect as one. 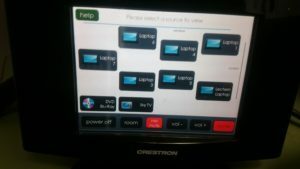 The switcher is the sort of device you would buy if your TV at home only has one HDMI port and you had multiple devices you wanted to connect: a DVD player, games console and a Freeview box. I then connected the Sky box to the switcher along with the Apple TV and Chrome Cast unit. 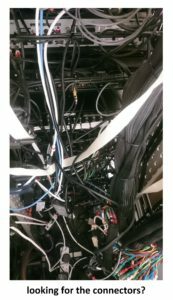 Then after finding power outlets, whilst still inside the AV systems rack, I carefully slid the switcher unit so its control switch faced out the front of the rack. A few cables ties and some Velcro later and the hardware was installed, all that was left to do was to climb out and check it all worked. Going back to the Creston AV touch panel, I selected Sky TV and sure enough it appeared on the projections screen as it should. Then by using the controls on the switcher unit I was able to toggle between Sky, Apple TV and Chrome Cast. It then occurred to me that both the Apple and Chrome devices use the HDMI to output their audio too. However the HDMI feeds to the projector which only projects the image, so audio would be lost. 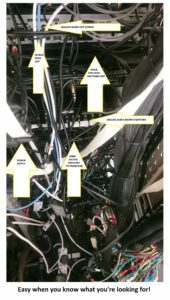 Climbing back into the AV rack, I noticed that the Sky box was using analog RCA connectors to output its audio to integrated ceiling speaker system. Fortunately the switcher also had 3.5mm TRS output (headphone socket), so by setting the Sky box to output audio through its HMDI it meant that all three devices were now feeding the audio and visual signal to the switcher. Then by using the RCA connector from the Sky box with the TRS adapter, all three devices were now feeding to the ceiling speaker system. I climbed back out of the rack and started to create a new, independent Wi-Fi network for devices to communicate. The new Wi-Fi network was actually the simpler part. I purchased an ASUS RT-AC3200 Tri-Band Giga-Bit Wi-Fi router. This router is enormous with six aerials and looks like the Batmobile. I figured that it would have to be reliable and be able to cope with large amount of data traffic, so I got the most powerful but cost effective router I could find. The idea behind the router was to have all the devices (Apple TV, Chrome Cast and whichever device is streaming) all on the same network, a network I could manage. Once on the same network, it was a matter of connecting. The Apple system was really straight forward- you join the same Wi-Fi network as the Apple TV (I named the network “presentations”) then chose the Airplay option on the device and as easy as that the screen is mirrored on the projector. The Chrome set up was a little more involved. With an android device, you have to install an app called Chrome Cast. Once installed it’s quite straight forward to pair with the Chrome Cast receiver and then the screen can be mirrored on the projector. With a Windows PC laptop, I had to install the latest version of Chrome. This then comes with the option to cast either just the browser tab you’re using or the whole desktop -this works well but compared to the Apple TV there is a slight lag. In some instances you would have to install the Chrome Cast extension for Chrome. I also connected the Wi-Fi router to our open Wi-Fi system with a RJ45 cable. This then allowed people on the Presentation Wi-Fi to still be able to access the net. We are still trialing the system before we start to officially offer it as part of a package, but so far so good. It has been received very positively from users. We’ve had people walking around with iPads – controlling their presentation and not being tied to the lectern with an old pc. We’ve even had the best man at a wedding wirelessly control the music playlist from his iPhone at the top table! PCs are still being used at the lectern as normal but without the need to trail VGA cable everywhere. The only thing left to work out is wireless power… I suppose batteries will have to do for now.